Clean Out The Gutters: Winter can leave behind leaves and other sediment in your gutters. Begin cleaning your gutters near a downspout, and remove any large debris like leaves and twigs. Clean out the fine buildup by flushing the gutter with a hose in the direction of a downspout. If the water doesn’t drain, there may be a clog in the downspout, so you may need to run a plumber’s snake through the pipe to remove the clog. Inspect the Roof: When the weather warms up, grab your ladder and head up to the roof to check for any cracked caulk, shingles that are buckling or missing, chimney damage and moss or algae stains. Replacing a few broken or missing shingles costs anywhere from $100 to $150, but larger repairs can cost up to $1,000. Remodeling Magazine cites that a full roof replacement is $19,528. If you notice any damage contact a roofing professional. Check for Pests: The spring temperature rise provides the perfect conditions for pests to take over your property. Homeowners in the Midwest should inspect for termites, bed bugs and other pests after the temperatures rise to the low- or mid-70s. Look for cracked paint, mud tubes on the outside of your home, small blood spots on sheets and dead insects for signs of an infestation. If you suspect an infestation, find a local exterminator. Get the Air Conditioner Ready: Don’t wait until the first very hot day of summer to do a once-over on your AC unit. Refer to your owner’s manual or do a quick Internet search to find out how to fix up your air conditioner. If you have central air, you can get your system ready for summer by having it serviced by a professional for $100 or less. Clean and Repair the Deck: Look for any loose posts or boards, and repair them as needed. Give the deck a good washing with a pressure washer. The Home Depot offers pressure washers that can be rented by the hour, day or week. Winter weather can beat up patios and decks, so it may also need to be re-stained. Tidy Up the Garage: The garage is often a neglected area of the home. Things tend to pile up and without regular care it can get dusty, oily and dirty. Make it a summer ritual to clean out the garage from top to bottom. Flush the Hot Water Heater: Flushing the hot water heater prolongs its life and efficiency. Turn off the water supply, drain the hot water and flush out any remaining sediment. After you’re finished, test the pressure release valve and turn the water supply back on. Winterize Heating and Cooling Systems: If you use a window unit, remove and store it before the cold weather hits. If your home has central air, cover the outdoor unit with a tarp and keep it in place with bungee cords. For heating, make sure your vents aren’t blocked by anything, such as furniture. It’s recommended to have a professional inspect your furnace annually. Remove Ice Dams and Icicles: Not only are icicles dangerous to people, but they’re also heavy and cause damage to your home. Don’t let them grow, and remove them if you see them forming. 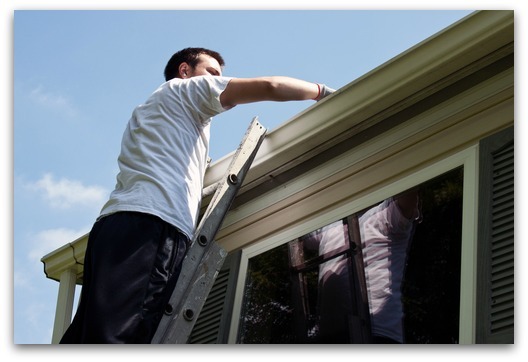 In addition, ice dams can pull off your gutters and loosen shingles on the roof, so they need to be removed. Deep Clean the Basement: Even if you’re just using your basement as a storage site, give it a good dusting and cleaning once a year. Check for mildew, mold, cracks and any signs of leakage.